This entry was posted on October 14, 2014 by thatpartychick. Peace, Love, and Party prevailed as Isabella’s friends were transported back in time to the Sixties for a groovy birthday celebration and sleepover. The birthday girl greeted her guests wearing hippie style floral bell-bottom pants and pink halter blouse. A flower garland in her hair and a peace sign necklace completed her outfit! Party goers were also encouraged to dress in Sixties attire. 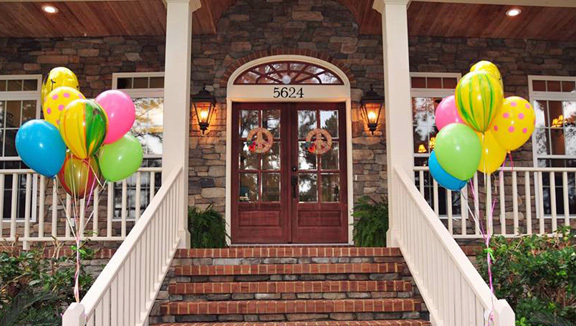 Colorful balloon bouquets decorated the front porch bannisters, and Peace Sign yarn wreaths hung on the front doors. 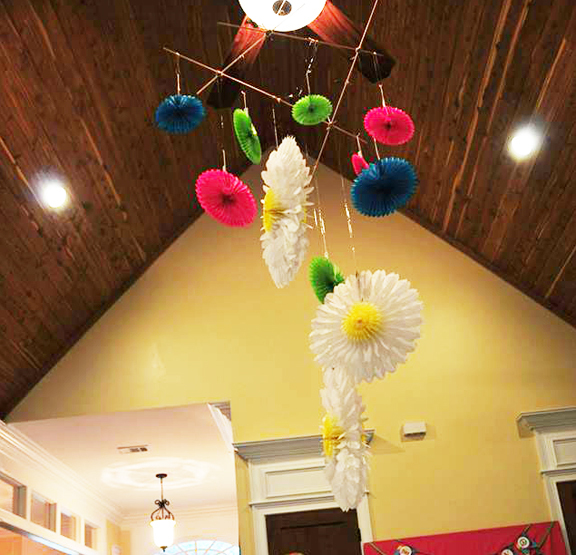 Flower power was in bloom with overhead paper blossoms suspended from the vaulted ceiling. 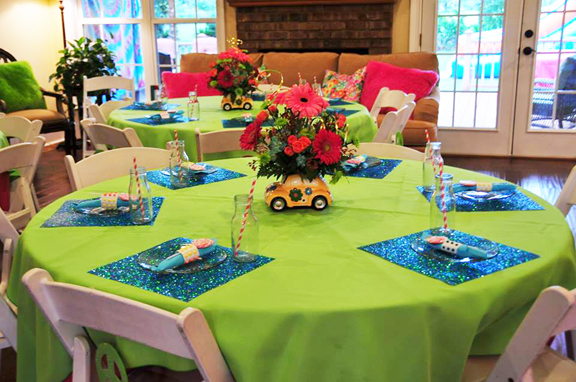 Round tables were dressed with green fabric over bright pink table cloths. 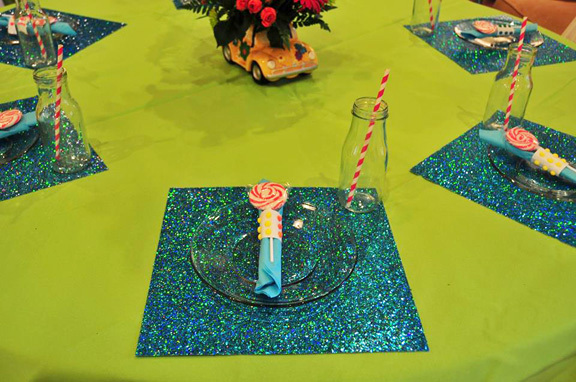 Table settings included blue and green metallic place mats, as well as turquoise napkins wrapped with candy dots and a lollipop. Beverages were served in old-fashioned glass bottles with pink and white striped straws. Peace signs hung from the chair backs. 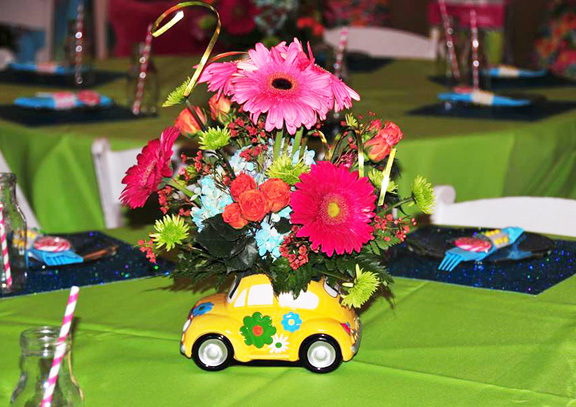 Vintage Volkswagen Beetles served as centerpieces for over-flowing floral arrangements. Tent Style Food labels were also in keeping with the party theme. 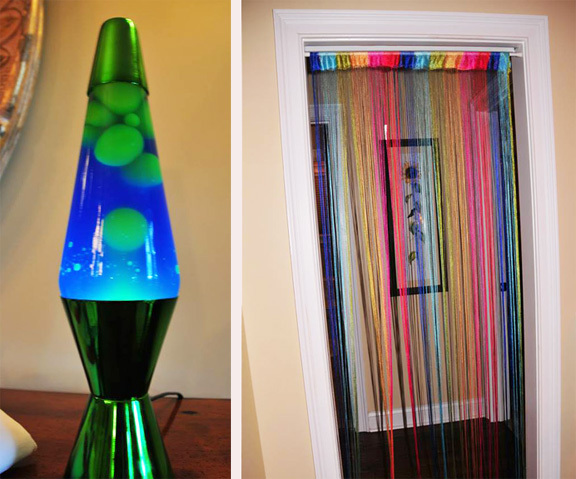 Mesmerizing Lava lamps and a yarn curtain were among the many decorations to set the mood. 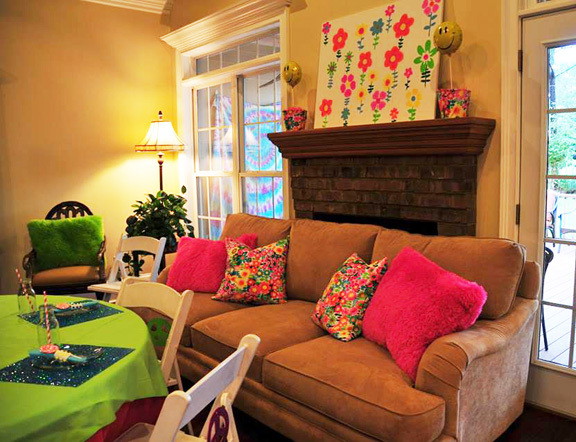 Brightly colored and flowered pillows decorated the sofa and chairs. A flower picture rested on the mantle with smiley faces mounted in flower covered buckets on either side. 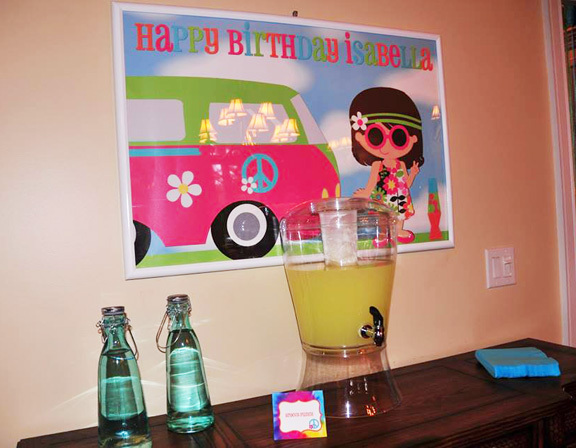 A “Happy Birthday Isabella” sign featured a likeness of the birthday girl sporting sunglasses and standing next to a camper van. 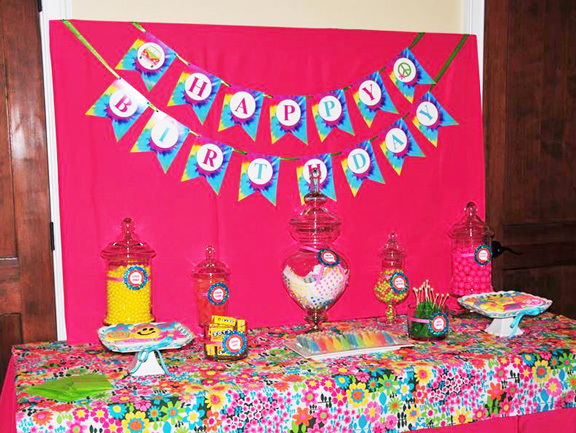 This amazing party included a colorful and inviting candy bar much to the delight of the girls. A “Happy Birthday” Tie-Dye flag banner was part of the backdrop. 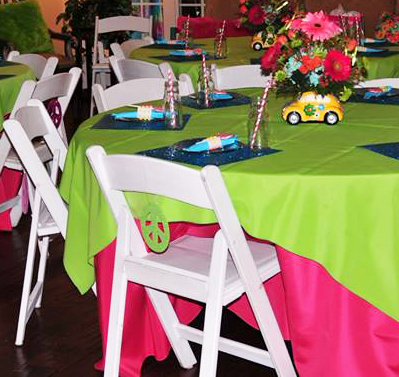 A pink table cloth was overlaid with flower designed fabric. The candy was served in a variety of unique decanters that had flower inspired labels with pink ribbon. 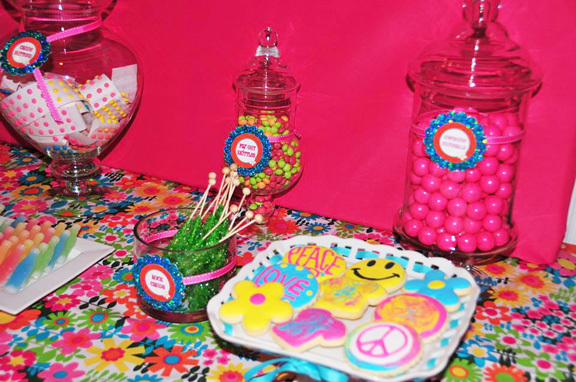 The candy bar included: Candy Buttons, Lemon Beads, Hippie Dots, Orange Slices, Awesome Gumballs, Far Out Skittles, Rock Candy, and Wax Soda Bottle Sippers! 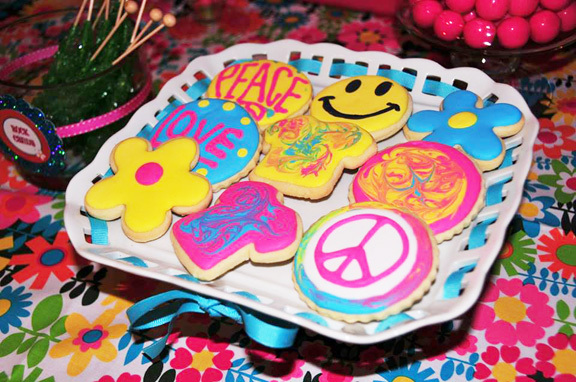 The cookies were delightfully arranged on a white footed platter with turquoise ribbon! 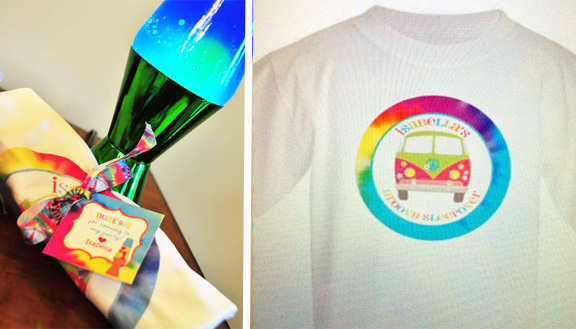 Some of the special designs included: ”Love,” “Peace,” Flowers, Smiley Faces, “Happy Birthday Isabella,” Peace Signs, and Tie Dye! 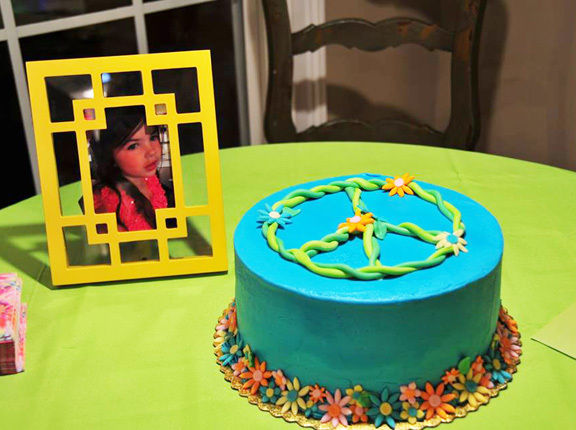 Isabella’s turquoise blue birthday cake featured a braided peace sign, a number “7” candle, and was encircled with flowers. 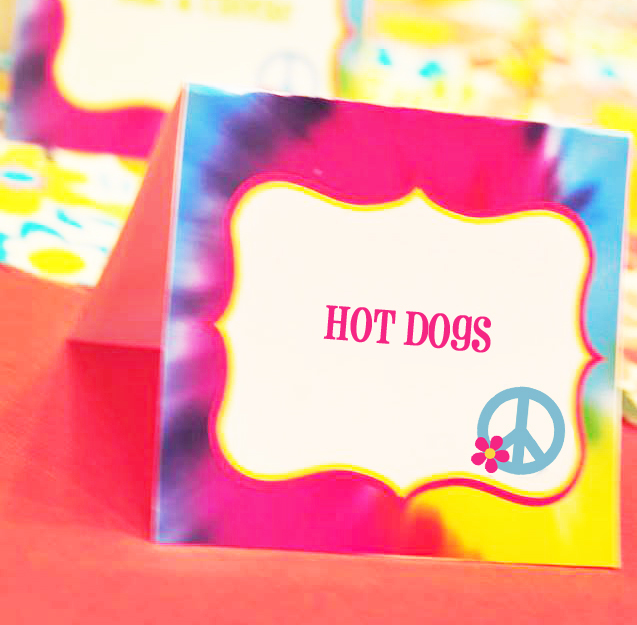 It was served with tie-dye napkins! Favors included miniature classic Volkswagen vans so characteristic of the decade. 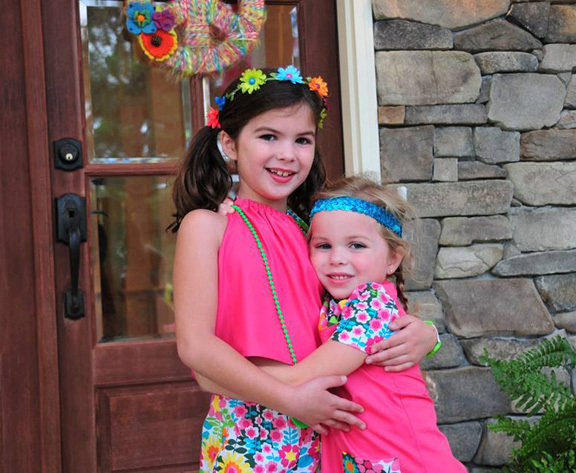 Guests were treated to a variety of hippie inspired sunglasses, necklaces, and bracelets. 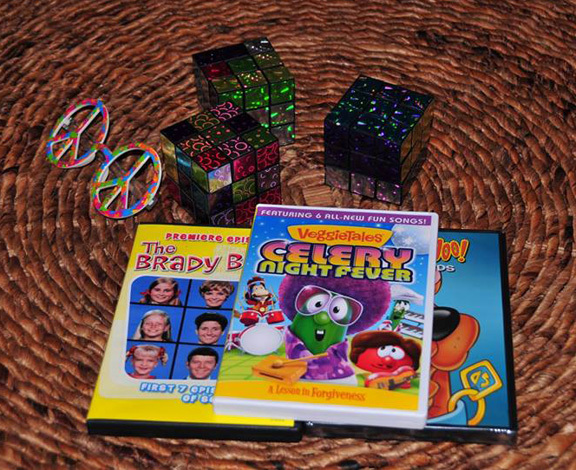 Game prizes were perfect for the theme! 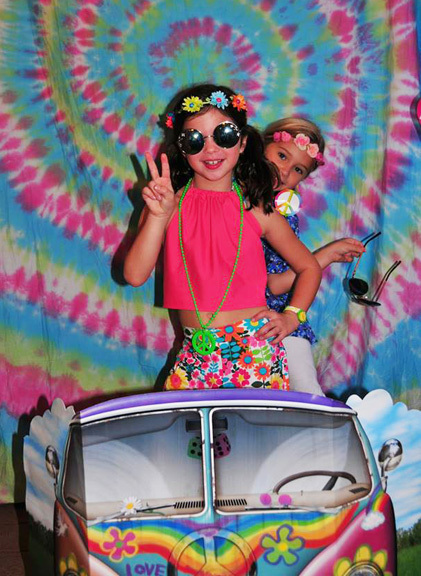 A fabulous photo booth included a love bus windshield with a tie dye backdrop. 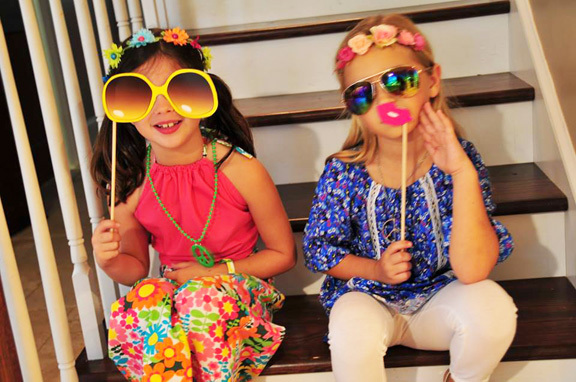 The Flower Children piled in for photos with all of the adorable props! 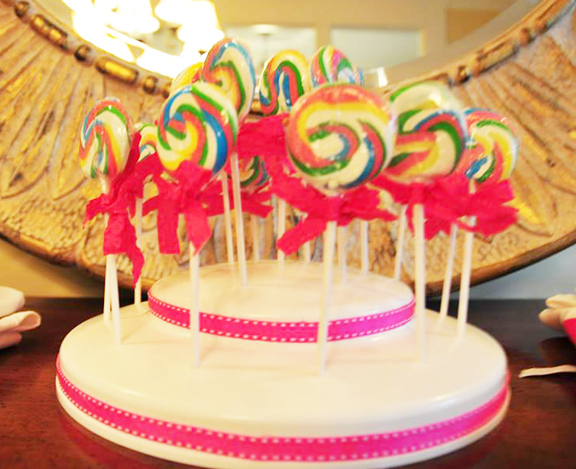 Lollipops tied with pink ribbons were displayed on a stand! 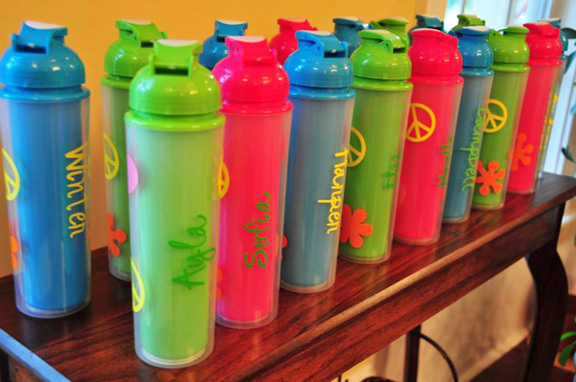 Personalized water bottles included painted flowers and peace signs. 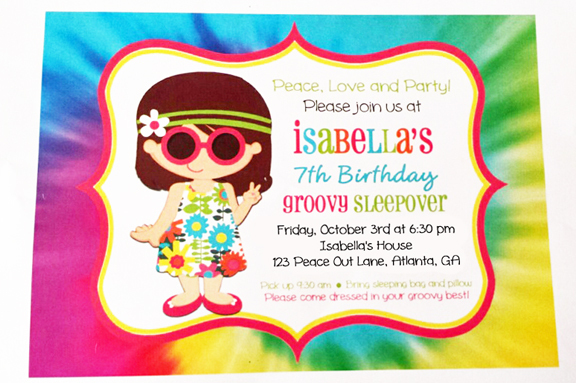 It was indeed a Groovy Sleepover for seven year-old Isabella! Peace!